It´s been way to long since we talked about Ebay. Please let me know if you´ve found anything fun lately. And in return I´ll show you mine. 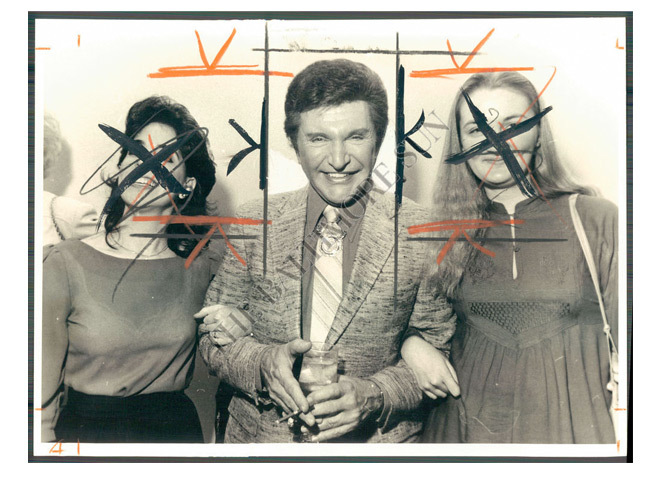 Photo of Liberace and two ladies. Liberace. What a extraordinary human. This photo I really want have already bought. Can´t wait to get it. One morning as I signed in to Ebay it said “Welcome back Jenny! Here are a some auctions recommended for you” and this leg was one of those recommended auctions. Too funny! I laughed all the way through check out. I´m not going to buy this. The kids would be fighting over it. Viola would say “I need the Blues mobile because I want to run the nazis off the bridge“. And Frank would plead. “No I want the Blues mobile so I can pick up Jake in prison“. The memories come pouring over me as I read these headlines for Days Of Our Lives on old Soap Magazines. DOOL (short for Days Of Our Lives) and I have had some good times together. Like when Hope came back from the dead as princess Gina. Oh the joy. And all the loveable personalities John has had: The priest, The solider and The art thief. Or when the alien twins came to Salem. But the story about Marlena getting possessed with the Devil has left few untouched and is usually what people (non DOOLers) want to discuss when they find out I watch the show. Sure it was really well played. But long time DOOLers know that there is so much more to this ever lasting TV drama. For me personally it has always been about Sami Brady. She got me hooked on the show with the way she stole her sisters boyfriend. The men of DOOL are usually really easy to get into bed but with this faithful hunk named Austin she had to get creative. Her elegant plot involved sexdrugs, fake maternity test, fake amnesia, a dying father and a whole lot of determination and an accomplice: Lucas, whom later turns out to be the real father to her baby. She almost made it to the alter. Here you can see it all falling apart for Sami. And then ,this clip, Sami 15 years later. Same old story that I can´t seem to get tired off. OK enough already Jenny, you are rambling! Ok ok one last thing: All you DOOLers out there reading (is there any?) will agree with me on this. There is no better surprise like the one when you realize the stranger next to you at that awkward dinner party is a DOOLer. Nothing beats it! Hey when did you start watching Days? I have seen it since i was à kid. My big sister used to watch it. But for real for about 15 years. I used to LOVE ‘Soap Opera Digest’. I miss my soaps! What soaps did you watch? Haha kirstens evil twin är ändå bäst. Haha den bilden.. Vem kan ta det på allvar? I´m longing for the photo. Ebay has something for everyone thats for sure!